Dr. Goldman is an Assistant Clinical Professor, Department of Obstetrics & Gynecology, Columbia University Medical Center, New York, NY. Dr. Malone is Professor and Chair, Department of Obstetrics and Gynaecology, Royal College of Surgeons in Ireland, Rotunda Hospital, Dublin, Ireland. Prenatal diagnosis has revolutionized prenatal care from the perspective of both the patient and the physician. For the patient, prenatal diagnosis provides genetic, anatomic, and physiologic information about the fetus or fetuses that can be used to make informed and individualized decisions regarding the pregnancy. For the physician, prenatal diagnosis provides vital information that can be utilized for better antepartum management. Information regarding specific anatomic anomalies affords the physician the opportunity to offer the patient sophisticated prenatal procedures, such as fetal surgery or selective fetal reduction in multiple gestations. Likewise, prenatal knowledge about genetic, physiologic, and/or anatomic abnormalities enables the physician to tailor or manage the timing and mode of delivery for optimal maternal and fetal outcomes. Prenatal diagnosis also allows the neonatal and pediatric specialists to be adequately prepared for a potentially ill neonate at delivery. Recent progress in the fields of maternal fetal medicine, radiology, and genetics has resulted in great advances in prenatal diagnosis. The following article will review the recent major advances in this rapidly progressing field. In recent years, there have been significant advances in antenatal screening for fetal aneuploidy. Fetal aneuploidy is defined as an abnormal number of chromosomes instead of the usual diploid complement of 46 chromosomes. One single additional chromosome is termed trisomy and is an important cause of congenital malformations as well as of congenital mental retardation. Down syndrome (trisomy 21), Edwards syndrome (trisomy 18), and Patau syndrome (trisomy 13) are the most common trisomies. Trisomies 18 and 13 are lethal and affect approximately 1 in 3000 and 1 in 5000 live births, respectively. The majority of infants with trisomy 18 die by 1 year of age, while the majority of infants with trisomy 13 die by 3 months of age. Trisomy 21 is compatible with life and affects approximately 1 in 800 to 1 in 900 live births. It is associated with congenital heart defects, most commonly the atrio-ventricular canal defect. 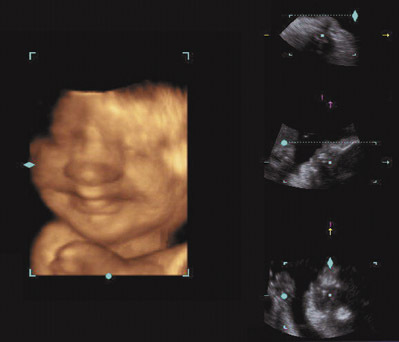 First-trimester ultrasound is one of greatest contributors to the recent advances in prenatal diagnosis and is rapidly becoming the cornerstone of screening for fetal aneuploidy. 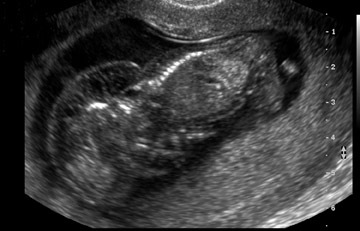 Techniques used to evaluate risk for Down syndrome during the first trimester include nuchal translucency (NT) sonography, assay of first-trimester maternal serum markers, nasal bone sonography, and Doppler sonography of the ductus venosus. In a portion of cases, obtaining an adequate NT may not be possible. When measuring the NT is difficult, the patient may return for a repeat examination in 1 week, provided that the gestational age is <14 weeks when the patient returns. Once the NT measurement is acquired, a special software program is used to convert the millimeter measurement into a multiple of the median (MoM) value. The MoM value takes into account gestational age variation in NT size, while allowing for the integration of maternal age and serum results. While the advances in first-trimester screening are exciting, there will always be a role for second-trimester screening. Many patients may not present in time for first-trimester screening. Likewise, many patients may not have access to providers skilled at NT sonography or skilled at CVS. A portion of patients may prefer amniocentesis to CVS. In addition to second-trimester maternal serum screening (which was discussed previously), other second-trimester screening methods include ultrasound detection of anatomic abnormalities as well as ultrasound detection of minor markers for aneuploidy. At the time of second-trimester anatomic ultrasound, any major fetal structural anomaly (such as a cardiac defect, omphalocele, diaphragmatic hernia, duodenal or esophageal atresia, renal abnormalities, clubbed or rocker-bottom feet, holoprosencephaly, meningomyelocele, and/or proboscis) should prompt immediate consultation with a genetic specialist, as these findings have been associated with trisomy. Invasive prenatal diagnosis should be offered for any major congenital anomaly. The optimal time to perform an anatomic survey is at approximately 18 weeks' gestation, as evaluation of the fetal anatomy is maximized at this time. Likewise, amniocentesis results can be obtained in a timely manner, and termination of pregnancy is still an option if the patient desires. 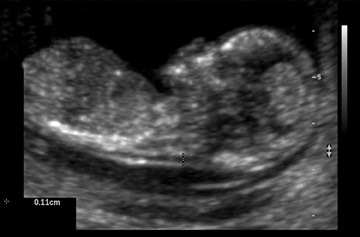 In addition to major structural anomalies, second-trimester ultrasound can detect minor markers for aneuploidy. 25-27 These findings are not fetal malformations. Rather, they are specific ultrasound findings that have been associated with an increased risk for fetal aneuploidy in certain high-risk populations, such as those of advanced maternal age or those with abnormal serum screening results. The role of these markers in the low-risk population remains uncertain. These markers include nuchal thickening, mild ventriculomegaly, a short humerus or femur, echogenic bowel, enlarged cisterna magna, renal pyelectasis, echogenic intracardiac focus, hypoplastic nasal bones, a single umbilical artery, choroid plexus cysts, and overlapping fingers. Detection of these minor markers should prompt consultation with a genetic or maternal fetal medicine specialist who is experienced at counseling patients regarding the risks associated with these markers. Use of likelihood ratios may be useful for integrating these markers into a precise risk assessment. A detailed discussion of these markers is beyond the scope of this review. Another option for screening for aneuploidy that is gaining popularity is combining first- and second-trimester screening. Combined first-trimester NT and serum screening has shown similar results as second-trimester serum screening with the quad test with regard to screening for aneuploidy. 7 Combining first- and second-trimester screening maximizes the performance of both of these screening modalities. 28 At this point in time, patients receiving care at centers offering first-trimester screening and CVS may choose between 2 types of first- and second-trimester combined screening: Integrated screening and step-wise screening. Integrated screening is a 2-step approach in which results are withheld until both the first- and second-trimester screening tests have been obtained, at which time a single risk assessment is provided. Patients who opt for integrated screening have NT performed between 10 and 14 weeks' gestation. A measurement of PAPP-A is also obtained during this time period. Between 15 and 16 weeks' gestation, the quad test is performed, and all results are integrated together. The trisomy 21 detection rate with this method of screening is 94%, with a 5% false-positive rate. 29 This test is very attractive to many patients, as it maximizes the Down syndrome detection rate while minimizing the false-positive rate. 4 If NT is unavailable, "serum-integrated" testing that includes obtaining PAPP-A in the first trimester followed by the quad test in the second trimester may be performed. In step-wise screening, patients undergo first-trimester testing and are given the results at that time. The second-trimester screening then utilizes the first-trimester results as the new a priori risk. The advantage of this screening method is that patients may opt for CVS in the first trimester if their screening results indicate that their pregnancy is at increased risk for aneuploidy. Otherwise, they can wait until the second-trimester screening is completed and receive results that afford a better Down syndrome detection rate. While ultrasound remains the imaging modality of choice for the fetus because of its widespread availability and reasonable cost, it has several limitations. These include small field-of-view, limited soft-tissue acoustic contrast, poor image quality in pregnancies complicated by oligohydramnios, beam attenuation by adipose tissue, and limited visualization of the posterior fossa after 33 weeks' gestation because of bone cal-cification. 30,31 Magnetic resonance imaging (MRI) is now being used in conjunction with ultrasound to provide additional information for prenatal diagnosis. The advantages of MRI include the use of multiple planes for reconstruction and a large field-of-view, making the visualization of complicated anomalies easier. The main indication for fetal MRI is further evaluation of inconclusive ultrasound findings. It is also useful for evaluation prior to fetal surgery. 46 Fetal MRI has proven to be extremely helpful for the examination of many suspected fetal anomalies. Definitive indications for fetal MRI have not been established, and recommendations are based on case reports, small case series, and expert opinion. 30 Ultrasound of the fetal brain can be limited because many anomalies have a non-specific appearance. Likewise, technical factors can limit the appearance of the brain, such as bone ossi-fication. 47 In addition, severe parenchymal abnormalities often cannot be visualized with ultrasound. Fetal MRI has been particularly helpful with the diagnosis and management of suspected fetal central nervous system (CNS) abnormalities and is suggested if a CNS abnormality is suspected on prenatal ultrasound. 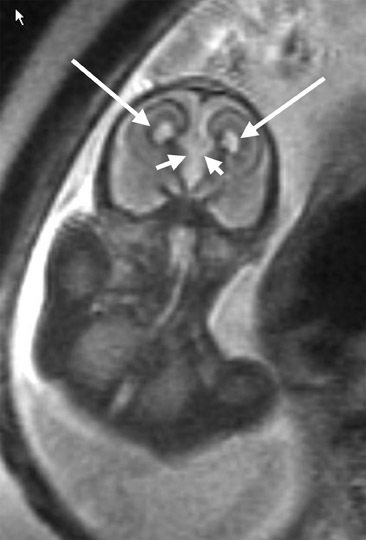 48 Fetal MRI can aid in the diagnosis of ventriculomegaly, agenesis of the corpus callosum, posterior fossa abnormalities, cortical gyral malformations, hemorrhage, holoprosencephaly, arachnoid cysts, neural tube defects, and vascular malformations. 34 In fact, MRI has changed the diagnosis and aided in the management of many cases of suspected CNS abnormalities on ultrasound. 47,49 MRI can help better clarify the diagnosis and help patients make decisions such as whether or not to continue with the pregnancy. Levine et al 47 compared 242 ultrasound studies and 242 MRI studies of the CNS in 214 fetuses with suspected CNS abnormalities or who were at high risk for CNS abnormalities. At confirmatory ultrasound, 69 fetuses had normal CNS imaging. Approximately 80% of fetuses in the study (171 of 242) had postnatal follow-up. MRI provided additional information in 50% (72 of 145) of cases and actually revealed a new major finding in 32% (46 of 145) of fetuses with abnormal ultrasound findings. In patients with previable fetuses, this information was utilized to help patients decide whether to continue or terminate the pregnancy. In patients with viable fetuses, this information was used to help determine the mode and the location of delivery (community hospital versus tertiary care center). With regard to the fetal neck, MRI can help distinguish between lymphangioma and cervical teratoma. 30 As neck masses can compromise fetal breathing at birth, MRI can help with the assessment of the fetal airway so that the proper precautions are taken at delivery. Fetal MRI is not currently recommended as a primary imaging method for any fetal anomaly or condition. The information obtained from MRI can be used in conjunction with the information obtained from ultrasound. Fetal sonographic examination is important for selecting appropriate fetuses whose management could benefit from MRI. Fetal MRI is suggested for cases in which ultrasound cannot make a definitive diagnosis and when a large field-of-view is required. In addition, it may provide additional specific information necessary for fetal intervention, including fetal surgery. It is important to remember that that the field of fetal MRI continues to rapidly evolve as technology advances and as new applications are determined. Noninvasive diagnosis of fetal anemia by Doppler ultrasound: Previously, the diagnosis of fetal anemia required percutaneous umbilical blood sampling (PUBS), an invasive procedure with an inherent risk for fetal loss. 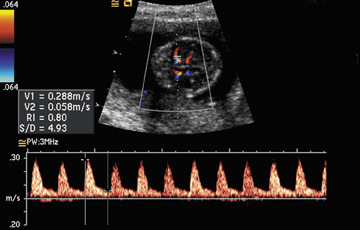 Doppler measurements of the middle cerebral artery peak systolic velocity can now be used to noninvasively diagnose anemia in fetuses without hydrops who are at risk for anemia secondary to conditions such as Rh(D) sensitization and parvovirus B19 infection (Figure 5). 74,75 This noninvasive method of detecting fetal anemia de-creases the number of invasive PUBS procedures needed in these high-risk patients. The value of the middle cerebral artery peak systolic velocity is expressed as multiples of the median. Middle cerebral artery peak systolic velocity >1.50 multiples of the median is considered suggestive of anemia and is considered an indication for PUBS (Table 1). While there have been exciting advances in the field of prenatal diagnosis within the past few years, the future holds the promise of great breakthroughs. Advances in the areas of genomics, proteomics, and stem-cell research are anticipated. It is expected that imaging mo- dalities will continue to improve, and it is hoped that techniques used in the fields of noninvasive prenatal diagnosis and in preimplantation genetic diagnosis will continue to advance. Accurate prenatal diagnosis of fetal abnormalities improves patient care by optimizing patient counseling and allowing for informed patient and physician decision making. Advances in prenatal diagnosis. Appl Radiol.